Take a moment to relax and enjoy a truly decent cup of Teadirect Decaffeinated in the knowledge that it's benefiting everyone.This tea has a refreshing bright brew with a warm comforting aroma, without the caffeine. About the Suppliers: Teadirect always pay tea growers guaranteed fair prices above market rates. In return they give Teadirect the pick of their crop, and you enjoy an excellent cup of tea. The tea is sourced from the highlands of Africa, where the perfect climate exists for growing tea. The plants in these regions receive the ideal amount of rainfall and sunlight to produce the tender fresh leaves that are hand picked everyday by people who have been producing tea for generations. Packs of 80 tea bags. The Teadirect Decaffeinated product ethics are indicated below. To learn more about these product ethics and to see related products, follow the links below. Better than other decaff tea brands and fairtrade! the only brand that our family member with high blood pressure will accept as alternative to caffeinated! Q: Please could you let me know which process you use to remove the caffeine from your tea please. A: Hi, the methylene chloride process is used to extract the caffeine from this tea. If you wish to know more, please do get in touch. Hope this helps, Robyn. 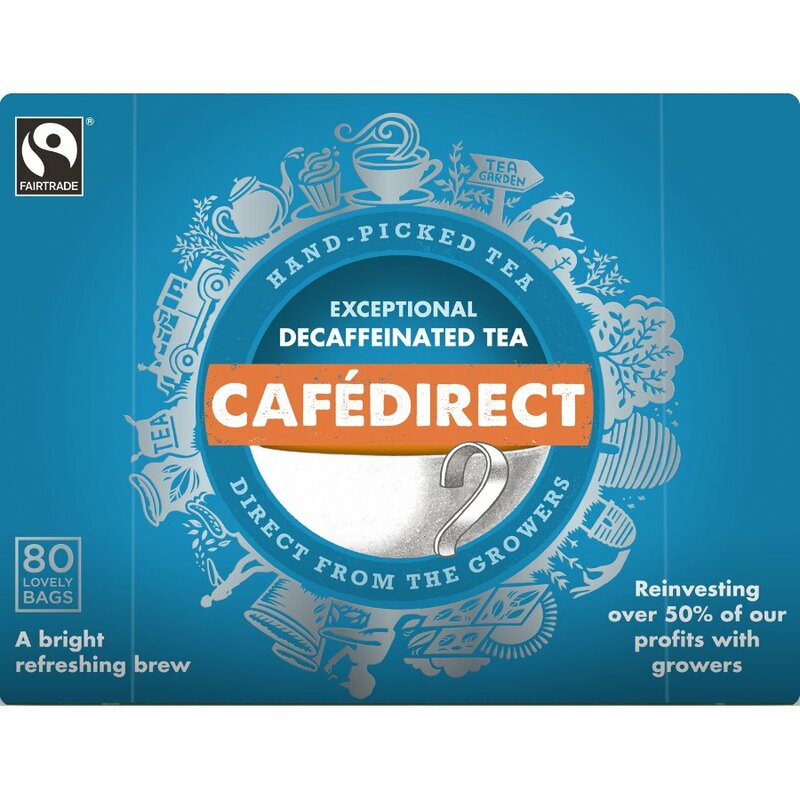 Cafédirect sells a wide range of fairtrade labelled teas, freeze-dried and filter coffees and hot chocolates and are the biggest Fair Trade hot drinks company in the UK. All Cafédirect products carry the Fairtrade mark, guaranteeing a fair and stable price to all the producer groups from countries all around the world. 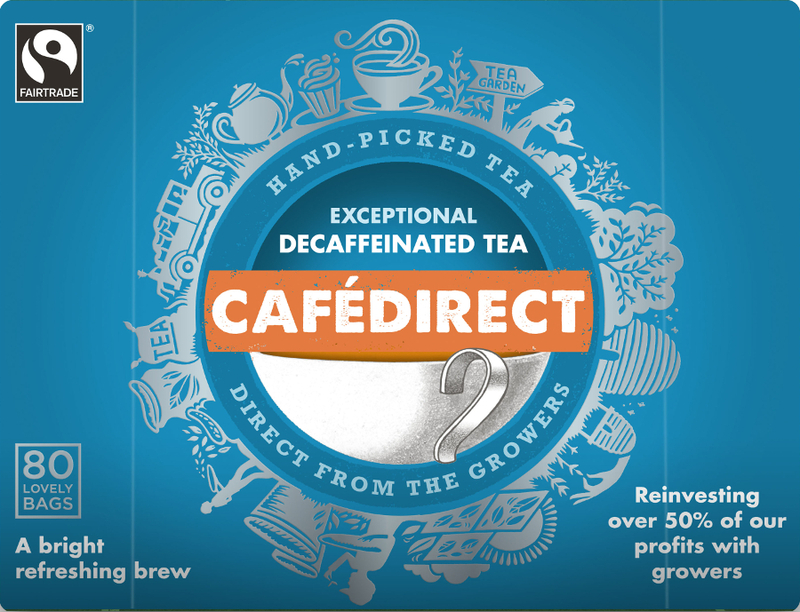 In addition to supporting tea, coffee and cocoa producers in 14 different countries through Fair Trade, Cafédirect also reinvests 50% of their profits back into businesses and communities of these grower partners. The mission of Cafédirect is to change lives and build communities through sustainable, inspirational business, focusing their social and economic impact in the developing world. Share in the vision of Cafédirect and support them and their products by purchasing them today. Natural Collection now features the widest selection of Cafédirect products in the UK.